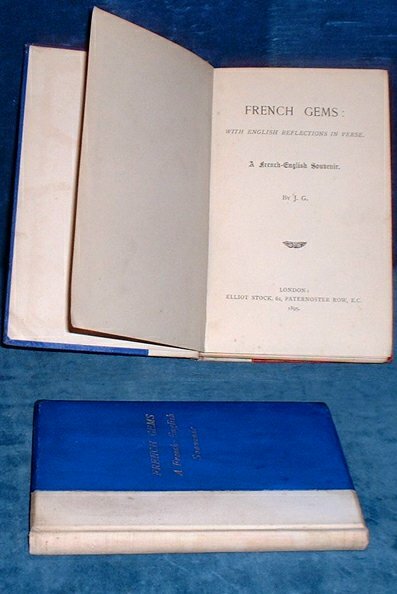 Title: FRENCH GEMS: With English Reflections in Verse. A French-English Souvenir. Description: London, Elliot Stock 1895 . Duodecimo cream, blue & red cloth gilt lettered to cover on bevelled boards (tips worn/edges dusty/lower red board bit marked). Titlepage +Dedication +pp Preface & contents +9-79pp. Lacks rear end paper. Most facing pages in French with English opposite but not all pages are translated. *Dedication says "This Little BooK is respectfully dedicated to the Friends of the French Mission which is conducted by the Rev. J.M.H. du Pontet de la Harpe, of the French Reformed Church in Bayswater". Some few of these offerings have appeared in a magazine but most are here printed for the first time. Scarce.